ActiveBand jaw and facial muscle system for the TheraBite jaw motion rehab system. The ActiveBand is an accessory for the TheraBite system for strengthening the chewing and facial muscles. The ActiveBand can be adjusted to provide increasing resistance for progressive exercise and improved muscle strength. 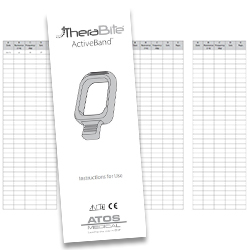 The TheraBite ActiveBand comes with the silicon band, an adhesive load scale, and a manual/tracking log. The ActiveBand is used by adhering the load scale to the handle of the TheraBite. The ActiveBand is then placed around the TheraBite handle at the desired load. The ActiveBand then compresses the handle to provide resistance to the user for them to bite against the mouthpieces to develop their oral muscle strength.